Earlier this month, Congresswoman Alma Adams of the 12th District penned a letter urging Governor McCrory to veto a bill that would unnecessarily restrict food aid for childless adults who are very poor and live in areas where jobs are scarce—regardless of how hard they are looking for work. States can temporarily suspend work-related time-limits on federal food aid for areas with sustained high levels of unemployment. North Carolina officials applied for a waiver in July for 77 of the state’s 100 counties due to a severe lack of jobs available that hampers North Carolinians’ ability to meet the work requirements. The bill, however, would permanently ban the Governor from ever pursuing this option irrespective of how local economies are faring or whether employment and training opportunities actually exist. Between 85,000 and 105,000 unemployed childless adults in North Carolina would lose food aid in 2016 if the Governor signs this bill into law. * See this map of where they live. “House Bill 318 is [a] significant step backwards for supporting the hungry as they look for work,” wrote Congresswoman Adams. “All this bill does is punish people in high unemployment areas and limits the state’s ability to meet the needs of the unemployed,” she continued. 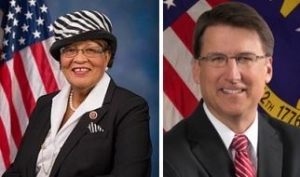 Congresswoman Adams is part of a growing chorus of voices calling upon the governor to veto this measure, including the NC Justice Center, the NC NAACP, and the state Legislative Black Caucus. Governor McCrory has until October 30th to veto or sign the bill, which will become law if he takes no action. 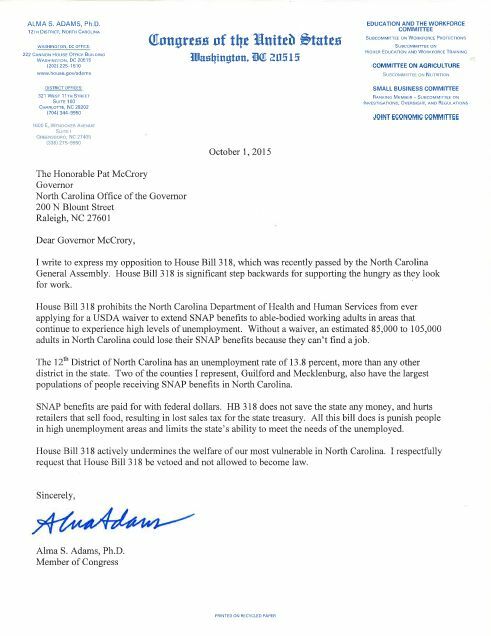 See Representative Adams’ letter to the Governor below. *Special data request to the Center on Budget and Policy Priorities. September 2015. Without your veto, there is a good chance that thousands of poor, childless, unemployed people could face severe malnutrition, or even death. Their only crime? Being unemployed, and living in a State that has politicians who are callous enough to allow them to go hungry. You can show enough backbone to stop this misnamed piece of legislation. We are counting on you.